Remember last year when I lost my mind and agreed to do my first craft show with only 12 days to prepare? You can read all about it here. Well, I think it was a little like having a baby. The moment it was over I thought “Whew, that was hard. I don’t think I want to do that again.” But as time passed, I started to gloss over the negatives and entertain the idea of doing it again this year. The closer it got, the more sure I was that it was a good idea. I sent out a couple of applications, and the short version is that my first outdoor show is the PDXetsy Pop-Up Market, which is in less than 4 weeks. Fortunately, we still have a white tent we bought for the wedding last year, so I had a good start on an outdoor booth. We set it up in our driveway, and one of the first things I noticed was how boring it was. It’s a MUCH bigger space than I had before, so I’m working on filling it, which doesn’t leave much time for making décor, but something to add a little personality was going to be necessary. Since many of my items are brightly colored, I thought black and white flag bunting would be a good choice. It also happens to be one of my favorite color combos, so I was able to make about 56 feet of bunting by using fabric I already had. That’s right, over $150 worth (according to my quick Etsy search) without buying a thing. Some of that fabric has been on that shelf for a LONG time, like the print I’m pretty sure was left over from a quilt I made my son when he was just a little guy. It was a win all around. Because I was short on time, I came up with a pattern that allowed me to cut each triangle as one piece, with only one seam to sew. It also helped cut down on the bulk so the tips came out nicer. To make your own, you’ll need this pattern and cotton fabric. Cut as many as you’d like triangles on your bunting. Mine has twelve and measures about 14 feet total, with 2 extra feet of tie at each end and two inches between each triangle. 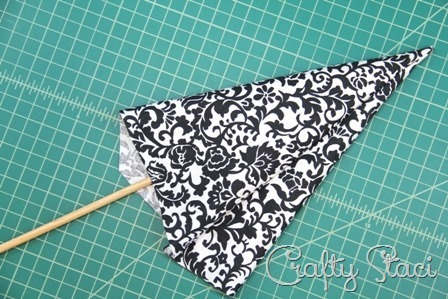 Fold the triangle with right sides together and stitch down the side, 1/4” from the edge. I don’t cut the thread in between, just keep feeding the triangles in. Once you’ve sewn them all you can clip the thread in between. Clip the tip off the seam to make them look neater once they’re turned. Turn the triangles right side out and push out the end with something pointy. Be careful not to push it all the way through. Press with the seam to one side. Once you’ve made all the triangles you need, lay them out in the order you want them to appear in your bunting. Stack them in that order and set aside. At this point, you can either use packaged bias tape or cut your own. I have a huge piece of black fabric that seems to be a poly cotton blend, which makes it useless for most of the things I make, but perfect for this. I cut it straight, rather than on the bias because I didn’t need or want it to stretch, into 2” wide strips. Lay the ends with right sides together, as shown in the photo below, and sew across diagonally. 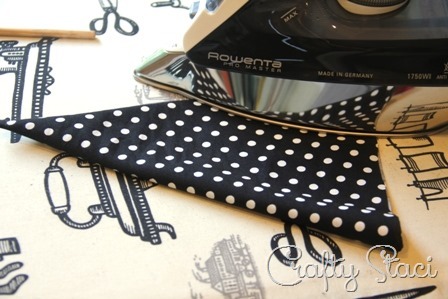 Add the next strip to the opposite end and sew the same way. Continue until all the strips are attached each other, except the two ends. Trim the seam close to the stitching. If you ever make bias tape, this little tool is a must. You just feed the fabric into the end and it makes the folds. You just pull it along and press as the fabric exits the end. For the 2 inch strips I use the #25 bias tape maker. 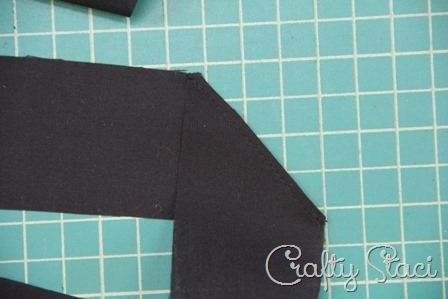 Once you’re done making the bias tape, fold it in half again and press. The next step depends on your confidence level. If you’re a fairly new sewist, I’d recommend pinning each of the triangles in place, then taking it to the sewing machine. If you’re more experienced, you can try the method I used. Fold the end of the bias tape to the inside and stitch close to the folds until you reach the point the first triangle should go (24” from the end on mine). Slide the top edge of the triangle inside the fold of the bias tape and continue stitching. When you reach the end of the triangle, measure 2” and slide in the next triangle. Continue to the end, folding in the end of the bias tape before stitching. And now I have miles and miles of bunting, in relatively little time. The best part about this is that I’ll be surrounded by a bunch of fabrics I love, some for years! I can’t wait to see this in my booth next month!